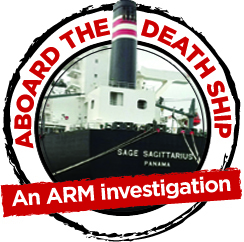 A CREW member confessed to the captain of the Sage Sagittarius - the so-called "death ship" - that he had penned a complaint ready to file with authorities outlining allegations of gun-dealing, bullying and refusing to pay overtime. This was apparently not enough to bother Captain Venancio Salas Jr.
Mr Salas gave evidence to the inquest into two deaths aboard the ship in late 2012, as the Sagittarius ventured into Australian waters to collect coal from the Port of Newcastle. The first was the disappearance of chief cook Cesar Llanto as the ship sailed south more than 900km north-east of the Central Queensland coastline. The second was that of chief engineer Hector Collado who fell 11m to his death as the ship arrived in Newcastle, just hours before he was to fly home to the Philippines. The New South Wales Coroner's Court heard on Thursday that both deaths appeared "highly suspicious". A third man - a safety supervisor named Kosaku Monji - would be crushed to death when the Sagittarius unloaded its coal in Japan. His death is outside the jurisdiction of this inquest. Crew have given evidence to the Australian Federal Police accusing Mr Salas of selling guns sight-unseen on board, and attacking openly gay kitchenhand Jessie Martinez. The lost cook worked closely with Mr Martinez, and is understood to have been trying to help the new sailor who has accused the captain of abuse. The court heard that before Mr Llanto disappeared, Mr Martinez drafted a formal complaint to Australian authorities and the International Transport Workers Union, which acts as an advocate for seafarers. Mr Martinez had used the chief cook's laptop, in the days prior to his disappearance. Capt Salas said Mr Martinez told him the letter made accusations against him. Mr Salas told the court that Mr Martinez was no longer willing to pursue complaints but was scared that a colleague might send it against his wishes. He told counsel assisting Philip Strickland he did not ask to see it. "There was no reason for the ship to be detained," Mr Salas told the court. "I don't think it's an important message. "If it worries (Martinez), I told him to just delete it." Mr Salas said he held no ill will towards the chief cook allowing Mr Martinez to use his laptop to make the complaint. Mr Llanto disappeared from the ship around the time that Mr Martinez was talking with the captain. There is no strong evidence linking any crew member to the deaths of Mr Llanto or Collado. Hachiuma Steamship executive Kazuhiro Hayashi is expected to give evidence this afternoon. The inquest will resume later in the year. ALLEGATIONS of gun-running, homophobic abuse and the possibility of foul play dominated the first day of an inquest examining how two men died on a single coal-carrying ship in late 2012. 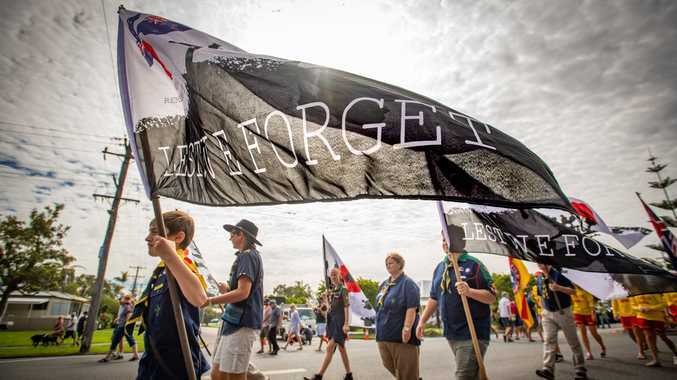 New South Wales Deputy Coroner Sharon Freund will wade through information to find out who or what killed Filipino chief cook Cesar Llanto and chief engineer Hector Collado as the MV Sage Sagittarius ventured through Australian waters. Mr Llanto vanished from the ship as it ventured south through the Coral Sea off the central Queensland coast. Mr Collado fell 11m to his death as the Sagittarius arrived in Newcastle. Both deaths are considered suspicious by Australian authorities. A Japanese supervisor later died after being pulled into industrial machinery on board as the ship arrived back in Japan. His death is not a primary focus of this inquest. The Sage Sagittarius is one of thousands of merchant ships that visit Australian ports each year, including those along the Queensland and New South Wales coastline. In the past five years, the Sagittarius has visited the ports of Gladstone and Abbot Point. The Coroner's Court heard crew allegations that a young, gay crew member was the target of bullying - sometimes physical - because of his sexuality. In a video shown to the court on Thursday, sailors can be seen showing a hand-drawn "wedding permit" to gay kitchen hand Jessie Martinez as they ridicule him. It is soon signed by the ship's captain Venancio Salas Jr. The bulk of the crew are seen drinking and dancing to Men at Work's Down Under. The court later heard that Captain Salas was accused of selling firearms to the crew in testimony given to the Australian Federal Police. A source described only as "crew member" said the captain had contacts within the Philippine Navy, and seafarers were buying firearms to stay in the captain's "good books". The court was told of one account claiming the captain "openly berated" crew members who declined. Mr Llanto's widow Nelia broke down repeatedly as she faced cross-examination from Mr Strickland and the International Transport Workers' Federation, which represents seafarers. She explained why she believed her husband would never have taken his own life. "He told me that once he returned from that trip we would buy a second-hand car," she said. "The rest (of his earnings) would be used for the future of our children. "He loved us very much. He was looking towards his return." Forensic pathologist Dr Brian Beer told the court a 2cm cut from Mr Collado's head appeared to be no accident. Dr Beer - who conducted the autopsy on the senior engineer - said there were no objects nearby that could have wounded Mr Collado in that way. There was no evidence of blood, hair or skin left on any edges or railings. The court heard Mr Collado bled from the cut before falling 11m down stairs to his death as the ship arrived in Newcastle. Today the inquest will question the ship's captain and a senior executive from ship owners Hachiuma Steamship. The muddy waters surrounding the 'murder ship'.